What are your dreams and goals for your future? Do you feel stuck and not really enjoying the life you have? It’s easy to think we have no control over anything in our life that happens to us and we just need to live with where are now. We can easily compare what we have to the great life others seem to have, and discontentment can set in real quick. Looking great on the outside seems to be the norm in this social media society. But what if YOU really had some say over the direction your life went? I’m not talking about things life disease, the weather, or controlling what other people do. Very often, we get discontent with our life and so we start trying to find a way to feel better. Sometimes they’re constructive changes-go back to school, start going to church, meet new friends, volunteer. But sometimes out of our discontentment we make destructive choices-that hurt the people we love and ourselves. We all go through it at some point. But I want to challenge you to start thinking differently. What are your goals and dreams that you put aside thinking it just wasn’t possible? our mindset, we can change our life. It doesn’t mean we can control everything that happens, but I do believe we can turn our lives around if it’s not going in the direction we want. Sure, it’s going to take a lot of hard work and perseverance, but I know it’s possible. Many people get caught up in affairs because of a discontentment in their lives, so it’s very relevant to our theme. (This is Part 2 of the blog post the top 10 stages of healing after an affair, for the unfaithful wife. If you haven’t read it yet, I’d like to encourage you to go there now and check it out). Go ahead, I’ll wait. This post is a continuation from that one. so, on that post we talked about the various stages of an affair, along with the emotions and healing process that usually correlates with each stage of the process. Here is a quick summary of the top 10 stages of healing after an affair. Thinking about having an affair, but just flirting with a man, no big deal. Already started an affair, husband does NOT know. Husband knows about the affair, D-Day has happened, and he’s devastated. 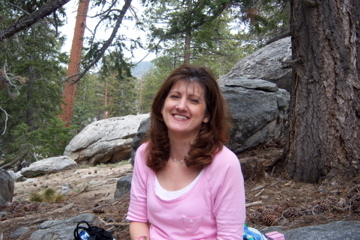 Husband does not know the WHOLE truth about my affair, I left out a lot so I wouldn’t hurt him as much. Not sure about the decision I’m making to stay in my marriage and work it out, or leave my marriage and be with my affair partner. My life is a mess. People know about the affair and I feel so alone. I’ve tried to break it off with my affair partner, but I end up resuming some type of contact again and again. I’ve broken off all contact (one day at a time) and I really want my marriage to survive this, but where do I begin? My husband isn’t sure if he wants to stay married, he doesn’t trust me and is back and forth in his decision. We are working at healing our marriage after my infidelity but I sometimes feel like we’re not making enough progress. You may be saying “okay Debbie, this is great, but how will this help me to get healing? You’re right. There is no automatic healing from an affair. that it’s often hard to see how anything is going to ever change. Hold on with me for a second. Just do a few things. First, Just pick one of the above 10 stages that is closest to your current situation. How do you feel about the stage of healing (or not healing) you are in right now? Are you satisfied with it? Is your life all you hoped it could be? Second, look at which stage you WANT to be in? which stage would you pick? As you see where you are now, where on the scale of 1-10 stages of healing do you want to be? Again, if you knew you could have your wish, what would you want for your life to be next month? How about in 5 years? Do you want to be doing what you’re doing right now in 5 or 10 or 20 years, with your affair partner? Or, do you want a different life than this with your current family and marriage- only better than it’s been. Girlfriend, can you see that you were made for so much more than this? Then you’ll continue to stay stuck right where you’re at. And that’s no way to live. We often mistakenly believe we are just the product of whatever life throws at us. That we have no say in what happens to us. Yes, Sometimes that is true. But a lot of times it isn’t all together true. We do have a role in the life we want to have. Yet, it certainly was true for me, that I was not in control, when I was diagnosed with breast cancer, just after our family moved to Colorado. Things were finally getting better, we were well on our way to recovering and rebuilding our marriage. I didn’t get to chose when the breast cancer would announce itself. But I was able to chose my attitude in the midst of it. However, the stages of healing after your affair is something you do have some control over. The truth is you can’t control your husband and what he does. You can’t control what your affair partner (hopefully ex-AP) does. and you can’t fast forward the healing process. above your circumstances and to the purpose God intended for your life. 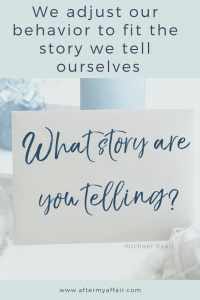 I didn’t really own that truth when I was going through my affair, and It really delayed my own healing, and the restoration of our marriage. So, take my word for it and save yourself much grief and heartache…. Do whatever it takes now to have the life you really want for your future…and for your families future. I truly care about what happens to you. if you are willing to do whatever you it takes to grab hold of it. Would you reach out to me and share where you are today after the affair. I’d love to hear your story and pray for you too. You can email me directly. I asked you to evaluate where you are currently in your life today, from that top 10 list. Then, to be honest with yourself and decide what do you want your life to be, if you knew it wouldn’t fail. What would you want for your life to look like on that scale next year, or in 5 years? 10 years? Take your time this week to really reflect on that last question. 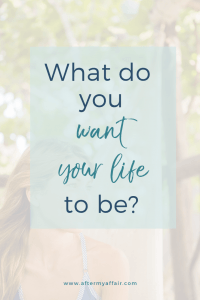 What steps can you start to take to get the life you really want to have by this time next year? or 5 years? Lay aside any excuses or small thinking holding you back from it. It may look hopeless in your marriage today, but I do believe it’s possible for a marriage to heal after infidelity. you can be restored and have the life and marriage you really want to have. It’s possible to start making choices to get you to that goal. Recovery after an affair is hard work. But anything worth having in life is hard work anyway right? do you want to know more about God? follow this link to learn more about Jesus who truly loves you more than any human ever could. 8 Love Bank Principles that will help your marriage heal.